Are you coping with swelling? 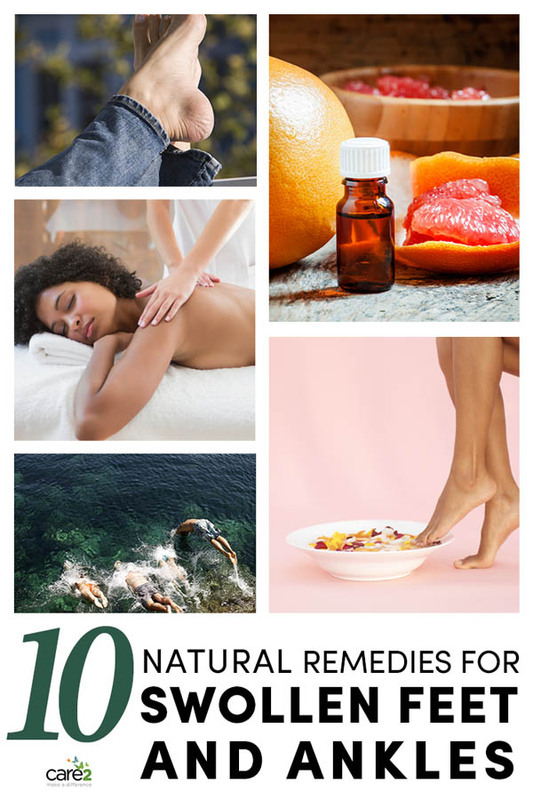 Check out some of these natural solutions to help relieve swollen feet and ankles! Swelling in your feet and ankles is called edema, and there are a lot of things that can cause the problem, from high blood pressure to pregnancy. What’s happening is your body is having trouble fighting gravity to move blood and fluids back up your legs, so your ankles, feet, and even your legs can begin to swell. Edema on its own is not harmful, but it is uncomfortable. If you are seeing one foot or leg swelling a lot more than the other, or your face is swelling, you do want to call your doctor, because the cause could be a blood clot, and you don’t want to wait to address that problem. Whatever the reason, these remedies can help give you some relief while you sort out the cause of your edema. Magnesium deficiency can contribute to edema, and taking a supplement can help give you some relief. Most of the recommendations I’ve seen are for 200mg twice a day, but if you’re pregnant you’ll want to talk to your doctor about that first. The RDA for magnesium is 350mg per day, and your doctor might not want you taking an extra 400mg, since you’re also probably getting magnesium in your prenatal vitamin and your diet. At six months pregnant, I started taking 250mg of magnesium in the evenings, and the difference in my swelling was dramatic without changing anything else. Exercise can help improve your circulation, and yoga is a great way to get moving and really focus on that circulatory system. Check out these yoga poses to improve circulation to get you going! Of course, you’ll want to talk to your doctor before starting up with yoga, especially if you haven’t been doing it before. If you’re totally new to yoga, I highly recommend taking a class. A yoga instructor can not only help you overcome any hesitations you have about yoga, but she or he will make sure you are doing the poses properly and might even be able to suggest additional postures to help with your edema! Once you have a swing of how the poses feel, you can practice at home. This one might sound a little odd, but soaking in room temperature – or cold, if it’s not too uncomfortable – tonic water can help with swelling. The quinine and the bubbles can help reduce inflammation, and frankly just soaking your poor, swollen feet feels great! A warm bath can also help with swelling, and you can give that water a boost with a few drops of grapefruit essential oil! You can also just fill a bucket with nice, warm water to soak in. If baths aren’t your thing, you can also mix a few drops of grapefruit oil with a carrier oil like olive or sweet almond oil and give yourself a little foot and leg massage. As you rub your feet, ankles, and calves, focus your pressure upward, rather than downward or in a circular motion. Adding a healthy dose of Epsom salts to the tub is another way to boost that bath. Like the grapefruit oil, you can also just use a bucket, if you’re only having swelling in your feet and ankles. If your calves are swollen, too, a bath is probably your best bet. Epsom salts are like magic for swelling. Even before I was pregnant, I took occasional salt baths after super long runs to help my muscles relax. A massage therapist can do wonders for swollen feet and ankles! Don’t be shy about mentioning the problem when you get to your appointment, so she or he can focus on getting things moving in your lower extremities. If you are pregnant, I’d recommending finding a therapist who specializes in prenatal massage. A prenatal massage therapist will be much more knowledgeable about how to make you comfortable. Seriously, I have never had so many pillows around me in my life, but all of that really does help make it a more beneficial experience. Support hose or compression gear can prevent swelling, especially from being on your feet. You can find compression socks that come knee- or thigh-high or full-on compression stockings. These suckers are hard to get on, because they’re meant to be pretty tight on your legs, but they can really make a difference. I have read a lot of great experiences with compression socks, but I’ve found that they start out feeling amazing, and after about four hours they start to make my feet cramp. You can find footless compression stockings, so if you experience the same problem, that might be a good solution for you. Gravity is not your friend when it comes to edema, so elevate your feet every chance you get! When you’re relaxing in the evening, prop your legs up on some pillows. Ideally, you want your feet above your heart. Take THAT, gravity! If you work a day job, try to find a way to prop your feet up under your desk. Even elevating a bit can make a big difference in your swelling as the day goes on. Excess salt is a big contributor to swelling, and upping your fluid intake can help dilute the salt in your system. Aim for 8-10 glasses of water per day to flush things out. Even better? Try making cucumber-lemon water! Just drop a couple of cucumber and lemon slices in your glass, and enjoy! Both of these fruits have anti-inflammatory properties, so if gives that water an extra swelling-fighting punch. 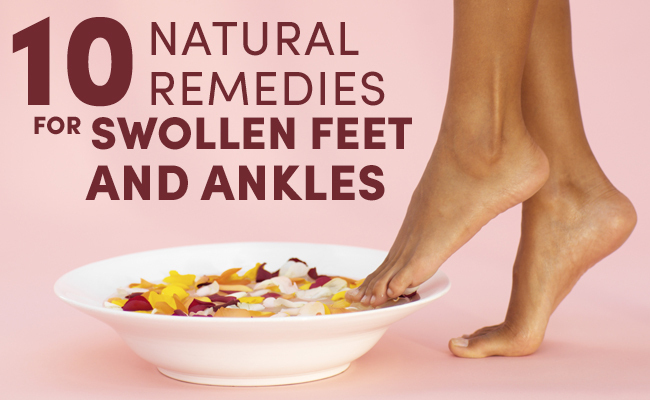 Have you guys found any natural remedies that help with swollen feet and ankles? I’d love to hear your tips and tricks in the comments! try www.swellnomore.com it has helped many lose swollen feet and has helped me for puffy eyes and i took one this am : ) Good luck!